Valle del Mis: an Introduction to the Dolomiti Bellunesi National Park. “Near us valleys exist that I have never seen anywhere else (…) the Valle del Mis, for instance, with its little side valleys, penetrates in an intricate network these wild mountains without glory … ”. This is a quote from renowned local writer Dino Buzzati, who deeply loved these mountains and often wrote about them. 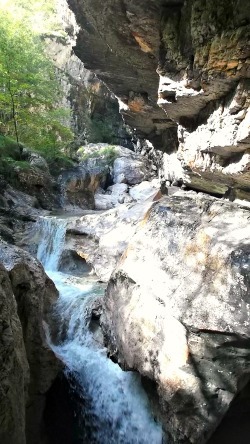 The Valle del Mis or Mis valley – also known as ‘Canale del Mis’ – is a long and narrow strip that connects the Val Belluna to the south-easternmost corner of Trentino. It certainly represents one of the main accesses to the Dolomiti Bellunesi National Park. The valley is cut by the Mis stream, which is enclosed between Monte Pizzocco (2,176 m) to the right and the Monti del Sole (the ‘Mountains of the Sun’) to the left. The first half of the valley is entirely occupied by the long Lago del Mis ('Mis Lake'; see an image above) – an artificial basin whose dam is situated right at the valley entrance (the dam is not visible from the road). The Valle del Mis is dotted with several rural hamlets, either on the valley floor or on the sunnier slopes, which were consistently inhabited until relatively recent. The construction of the dam with the consequent creation of the artificial lake, however, has ended up submerging the ‘lower’ hamlets and the cultivated fields, as well as the old road which used to run on the valley floor. To accelerate the abandonment of the valley has contributed also the big flood of 1966, so that since 1972 its lower section is completely uninhabited. The Valle del Mis is certainly one of the noteworthy locations within the Dolomiti Bellunesi National Park, and it is distinguished by its natural features and the somber, enigmatic fascination of its craggy and wild environments, with the presence of karstic canyons and gorges. The Mis valley is important also for the presence of floral species characterized by an eastern range of distribution, such as Austrian Pine (Pinus nigra), Ressmann Long-leaved Willow Flower (Knautia – or Ambretta – ressmannii), Carnian Bellflower (Campanula carnica) and Kerner’s Spurge (Euphorbia kerneri). If you pay attention, it is also possible to see or hear many passerines and other interesting bird species – like Golden Eagle and Black Woodpecker. The presence of the lake gives also the opportunity to observe amphibians like Grass Snake (Natrix natrix); among the birds there are Mallard (Anas platyrhynchos; overwintering around the lake) and Grey Wagtail (Motacilla cinerea). The rarity, however, is Common Merganser (Mergus merganser) – a large wild duck that eats fish. The quality of its biotopes (especially wetlands: lake, waterfalls, karstic springs, pot-holes) is further enriched by the discreet presence of small niches of old rural settlements – such as Gena Alta, Gena Media, Pattine, La Stua – and the numerous traces of past and recent human activities, often bearing the traits of abandonment (trails, mule-tracks, cultivated patches, old rural buildings, dry stone walls, terraces and ‘casere’ – old dairy pens); in the picture below, a traditional old street altar along the road to Gena Alta. The Valle del Mis is an important transversal corridor within the park, in the shape of a narrow and deep canyon set high, between smooth and receding rock walls. It is a very ancient glacial valley that crosses transversally the entire chain of the Dolomiti Bellunesi, thus allowing one to observe all its main geologic features, from the Scaglia Rossa (a red-coloured limestone) at the valley entrance to Main Dolomite at its core. The Valle del Mis – as it often happens with ancient valleys – is a complex environmental system, to whose evolution contributed several factors: glaciers, water courses, slopes’ degradation processes (landslides and erosion) and, locally, karstic erosion too. The glacial moulding, mainly due to the action of the ancient Mis ice sheet during the glaciations, is recognizable by the vaguely ‘U-shaped’ valley’s transversal profile, denoted by a relatively ample valley floor and steep side slopes. Particularly atmospheric is the segment of valley between Gena Bassa and Titelle (also known as ‘Canale del Mis’), since it takes the aspect of a deeply incised gorge dug into the stratified sub-horizontal rock banks of Main Dolomite, to whose formation have significantly contributed the karstic erosion processes (so to form a classic river-karst canyon). This canyon is bordered with a system of deep and narrow side valleys and ravines, some of which are clearly situated along important fault lines (Val Falcina, Val Brenton, Val Soffia, Val Rui Bianch, Val Lunga). f) the Val Falcina – a deep fluvial cut along which has been devised an interesting circular nature trail (described in more detail below). 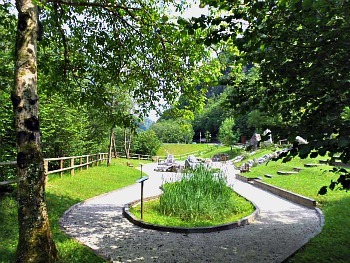 In the high valle del Mis – in an area known as Vallalta, not far from the boundary with Trentino – there were once also important mercury mines, active from 1700 to 1963, traces of which can still be detected today. Even though now the district looks abandoned and overgrown in thick vegetation, it still retains a peculiar charm. At the entrance of the valle del Mis there are also a couple of sites of natural interest worth mentioning now, before looking in detail at the features of the valle del Mis proper. This short itinerary follows the shores of the Lago di Vedana (Vedana Lake), highlighting its main natural aspects and peculiarities. It takes about 30 minutes to complete, and it is an easy trail suitable to all abilities, which can be walked in all seasons (mud is the only limiting factor, in case of heavy rainfall; in that eventuality, some sections of the lake can be flooded and the path may become temporarily impracticable). The Vedana Lake is situated in the municipality of Sospirolo (as indeed the whole lower valle del Mis), to the right of the Cordevole, in a small depression along an abandoned stretch of valley once occupied by the river. It is a natural lake that was formed following a block generated by landslides, consequence of the withdrawal of the ice sheet that once occupied the Cordevole valley in the Quaternary period, during the last glaciations (about 15,000 years ago). A sign of the passage of ice can be read also in the U-shape of the valley and in the presence of a high variety of rocks. The peculiarity of this small lake is the absence of water exchange, as there are no rivers flowing either into or out of it, but only small subterranean veins that feed it. 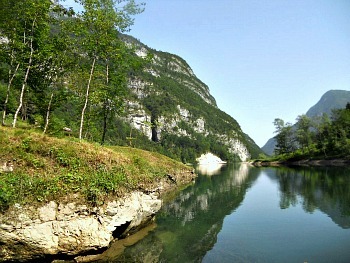 Given its uniqueness as a wetland in the southern part of the province of Belluno, and considering the presence of species often rare and not widely spread, the Vedana Lake is listed among the noteworthy biotopes within the province, and it is protected also at European level for its rich biodiversity levels. This path starts by the same car park for the Vedana Lake trail, so the two excursions can be easily combined, given also their short length. This route runs partly in woodland and skirts the hamlet of Torbe, to lead eventually to a belvedere (viewpoint) situated in the locality of Camatte. From there it is possible to admire the beauty of the Cordevole valley and the whole chain of the Pre-Alps north of Belluno – a backdrop to the notable building of the Certosa di Vedana (Vedana Charterhouse; described below) and the small church of San Gottardo, both visible in the background. This trail is 3,5 km long and takes about 60 minutes to complete; it is along a path which can be easily walked by all. The best time to visit is from April to September, even though there will be interesting features to admire at all times of the year. The ‘Masiere di Vedana’ include a vast area which is extended between the peaks of Monte Peron and Spiz di Vedana and the villages of Camolino and Roe di Sedico. The characteristic aspect of this natural feature is represented by enormous boulders, chaotically scattered on small hills of morenic origin (that is, leftovers from a moraine), formed by a mixture of different materials owing to the melting of ice after the Glaciations. To this is associated the creation of habitats which are quite differentiated: sunny little hills exposed to direct sunlight and therefore colonized by pioneer plants able to survive in prohibitive conditions for aridity, but also fresh and shady small valleys, as well as completely inaccessible rock formations, side by side to open fields – sometimes cultivated too. The end result is a patchwork of different habitats that can host a great variety of species, both animal and vegetal, which make the ‘Masiere di Vedana’ a local hotspot for biodiversity. For this same reason, the ‘Masiere di Vedana’ have been included in the list of biotopes of the Belluno province, and also in the European network of Protected areas. The site included in the ‘Nature 2000’ European network is in fact external to the boundary of the Dolomiti Bellunesi National Park, which runs just to the north. The former is a vast area of about 32,000 hectares situated on a 178-km-long strip of land running at the margins of the South-eastern Alps and including medium- and high-mountain environments (the altitude varies from 400 metres above sea level to about 2,500), contained between the Piave and Cismon valleys to the east and west respectively, and reaching north towards the Maé and Cordevole valleys. The variations in altitude and width account for the great variety of biodiversity displayed, as well as for the many habitats; all in all, contained here is one of the maximum expressions of biodiversity within mountain habitats of the whole world. Woodland. 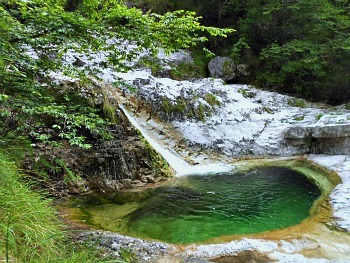 The Dolomiti Bellunesi National Park is characterized by a remarkable variety of woods. Although the roughness of the sites does not favour the development of extensive woodland (with the notable exception of the forests of Cajada and Grisol, both rich in majestic specimens of silver fir), the Dolomiti Bellunesi still offer the opportunity to admire extremely diversified forest landscapes. Among the species that live in the undergrowth, some tend to prefer shady locations and have therefore an early blossoming (especially those in beech woods). Wetlands. Of notable interest are the swampy fields, the marshy areas and the small ponds found in some locations within the park – such as Conca dei Laghetti near Erera, Pian dei Palui and Pra della Vedova in the Pramper valley and Conca di Palughet in the Cajada basin. These wetlands and their flora are extremely specialized; they are rare in the Park's territory, and therefore need particular protection and safeguard. Fields and Meadows. The presence of open areas in the park is mainly connected to the cutting of grass. Mountain fields and meadows differentiate depending on the humidity of the soil and its fertility, which may both be influenced by man through fertilization. Dry fields deserve special attention: they are often very localized and dotted with bushes in which botanical species of great phyto-geographical interest – such as Iris cengialtii or Lilium carniolicum – can be found. Flora of the Rocky Cliffs and Scree. Rocky landscapes are found within the Park from the valley bottoms to the highest reaches. Numerous vascular species colonize these extreme environments by developing their own root apparatus in the cracks between the rocks. This flora is of great naturalistic and scientific value, and it differentiates depending on the altitude, the aspect and the nature of the rocks themselves. Scree and Gravelly Terrain. Temperature variations and meteorological agents cause a progressive alteration of the calcareous and Dolomite rocks, whose breaking down originates characteristic accumulations of detritus at the base of the rock walls (scree). These environments, apparently sterile and inhospitable, are colonized by different species depending on the size and the mobility of the scree, as well as on the length of time in which snow dwells on the ground. Pastureland. High mountain prairies and pastures represent an important naturalistic and landscape heritage contained within the Park. The flora of these environments varies on the basis of water availability and exposure to sunlight, and it depends also on the degree of exploitation to which these habitats have been subjected in the past. Near the shepherds’ huts and the small dairy farms one can find the typical nitrophylous (acid-loving) grass communities too. Two of the most interesting features of the Valle del Mis, though, are undoubtedly the Cadini del Brenton and the Soffia waterfall, situated quite close to each other at the head of the Mis lake. To reach the Cadini del Brenton, park by a bend of the road just before the bridge on the Mis stream; walk past the ‘Campanula morettiana’ Botanical Garden (see above) and continue on an easy trail that enters a thicket of hazel, then leading to a sequence of 15 pot-holes created by a water erosion phenomenon; the small Brenton stream forms also a series of small waterfalls connecting them (see picture above). Situated at the heart of the park, this spectacular feature is amazing for the beauty of the colors taken by the water (azure blue, emerald green; see picture below) and its crystal transparency – depending on the light and time of day. The shapes are also incredibly interesting, as these pot-holes were dug in very peculiar ways; a trail goes all the way around the 'Cadini' (a word which literally means 'bowls', given their shape), and it takes only about 30 minutes to complete. Some of the pot-holes are rather deep (more than 4 metres) and are connected by rock slides and small waterfalls that enhance the beauty of the place. The phenomenon of rock moulding – here on Main Dolomite (‘Dolomia Principale’) – is partly due to the excavating activity of the stream, but also to karstic erosion. In particular, erosion due to the power of running water is carried out through the abrasive action of pebbles and sand, which determine – over time – the formation of hemispheric cavities. The circular trail allows to visit 11 out of the 15 pot-holes. As well as for the geo-morphological aspect, the area is noteworthy also for the vegetation of the rocks, which is rather interesting due to a phenomenon known in Italian as ‘dealpinismo’ – a term used to define Alpine species that descend to lower levels (here some high-altitude plants – such as the grass Carex firma, the Primrose Primula tyrolensis and the Buttercup Ranunculus alpestris – can unusually be seen at only about 500 metres above sea level). Now returning back to the bridge on the Mis stream, once passed it one can take to the right, where a short stretch of road leads to a small café/restaurant. The Soffia waterfall is situated nearby, while the café also makes for a restful and panoramic stop between the two locations. From the café/restaurant, an easy path takes in just 5 minutes to a panoramic platform suspended above the impressive waterfall, and situated among dramatic rock formations (see picture below). From a geo-morphological point of view, the canyon and the waterfall are both rather interesting. Inside the small canyon – which is enclosed by a natural roof of rock, leaning out for about 16 metres – besides the whirlwinds formed by water, one can also appreciate some notable plants, such as yew (Taxus baccata) and, in June, scented Yellow Day-lilies (Hemerocallis lilio-asphodelus). The presence of man over time is witnessed here by the dry stone-walls, and by the works carried out in order to exploit the force of the stream, thus showing that local people – when the valley was still inhabited – used to harness this natural source of energy for their activities. In the vicinity of the waterfall – in a location now skirted by the edge of the lake – were once a mill and a dwelling, while inside the canyon are still visible traces of the iron staircase that was placed there in the 1920s, at the time of the first appreciation of this locality for touristic purposes. 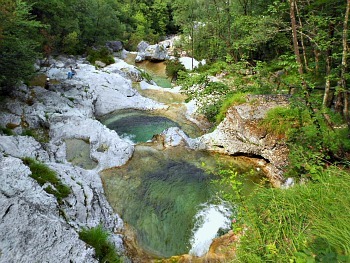 Today the Soffia waterfall can be easily visited, as the short circular trail (max. 15 minutes) allows one to get close to the most interesting viewpoints in absolute safety (see an image of the waterfall below). Subdivided among the three main hamlets of Gena Alta, Media and Bassa – between 400 and 800 metres of altitude – the lower Valle del Mis is situated in the municipality of Sospirolo. Once there were around 300 inhabitants here, but because of various combined factors (the creation of the artificial lake, several floods and emigration) now these three villages are completely uninhabited. 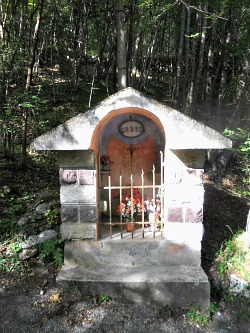 To begin with, Gena Bassa was canceled by the creation of the lake; only the small chapel of San Romedio was rebuilt, and it is still located behind the Soffia restaurant (on the way to the waterfall). To add to the other factors, during WW2 Gena Alta was hit by a violent Nazi reprisal, and the village was burnt down (below, see an image of Gena Alta). The locality known as La Stua (in the municipality of Gosaldo) is situated along the main road instead, right in the middle of the ‘Canal del Mis’. It was originally founded to be inhabited, but given its location it quickly evolved into a group of buildings to assist the travelers (mainly inns), together with a few industrial workshops (sawmill, watermill and a blacksmith) that used water power from the stream. 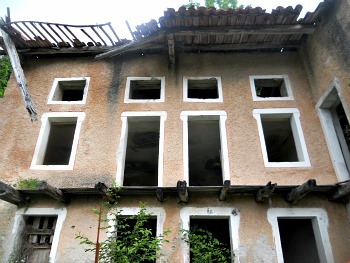 Devastated by the 1966 floods, this village is now little more than an atmospheric bunch of ruins, which the park is currently in the process of restoring. The hamlet known as California (a place name which is in itself a testimony to the emigration wave that heavily hit the area) was founded later – in the 19th century – as a base for exploiting the mercury veins of Vallalta (which at the height of their production were the sixth most important mercury mine on the planet). But in 1962 the mines were closed, and the local economy shifted successfully towards tourism – until the catastrophic 1966 flood stroke (read below for more on this). This event decreed the end for this village too, where an important hotel once stood, of which today only a few ruins are visible among the overgrown vegetation. All in all, for the events mentioned – and for being uninhabited – the Valle del Mis could easily be considered as an 'unlucky' place, but in fact the situation can also be read differently. The valley's peculiarities could be seen as emblematic of a tormented history common to many other mountainous areas and valleys within the Alps; in addition, the Valle del Mis now being protected by the Dolomiti Bellunesi National Park, this means that all of its various historical and natural features can be properly valued, certainly adding more and more to a visit over time. In the middle part of the 20th century, over the course of the years the small settlement of California had become a small tourist centre, aggregated around a hotel which had become famous, at that time, in the whole province of Belluno: scheduled buses ended their journey there; a beautiful road allowed easy connections towards Tisèr and, although not as straightforward, a link towards the Mis valley and – after that – the val Belluna was also operational. New houses had been erected thanks to the life blood brought by tourism, but unfortunately that November 1966 all projects concerned with the development and maintenance of the Upper Mis valley ground to a halt, and the population was forced to emigrate. From a research paper written after the events of 1966, and published by the Italian Geological Survey Service, one can extract interesting comments and explanations concerning the alluvial flood events which seemed to have reached their maximum height in this valley. One can thus read: “In the territory of Gosaldo, the mountain slopes were devastated by landslides; the small valleys were eroded at their sides, and the bottom of the roads were badly disarranged; the majority of dwellings suffered damage; many were destroyed or partially demolished; the streams Mis and Molini (or Gosalda) overflowed; the main village (Don) and the hamlet of California were overrun by heaps of debris and piles of stones dragged along by the water in full flood … ” – and on it goes along those lines. The rainfall on the 4th and 5th of November that year – and the subsequent exceptional floods that ensued – transformed the valley into “a horrid gorge, with the sides devastated by landslides and the bottom littered with heaps of mixed blocks of rock and debris, which in some places raised the level of the streams by several metres” (…). Again, still in the narrative we can read: “(…) The enormous mass of material swept along by the water overran and partly destroyed many of the buildings in the village, almost all of them recently built or restored; the few that remained, which were more or less seriously damaged, were left half-buried in the alluvial deposits. These, as a matter of fact, raised the beds of the Mis and the Gosalda (the latter in the final section) by several metres, thus transforming the green valley bottom into a white mass of rocks, amongst which meandered the waters of the streams” (…). Now very little of all this devastation remains, but a general sense of abandonment dominates the valley. However, since then the whole Mis valley has undergone a considerable transformation, which caused the collapse of whole parts of its territory, both from the morphological as well as the social and economic point of view, but at the same time other parts have started being redeveloped and enhanced thanks to the presence of the Park. Besides those mentioned above in the page, one such place is the Val Paganin. To begin with, the nearby hamlet of Pattine still retains some interesting examples of old vernacular architecture – albeit not in a very good state of preservation (but the Park is working on a restoration program here too). The landscape of the Val Paganin represents an eloquent example of the unique but also different history of the numerous Alpine communities in the Dolomites. The church at Tisèr, which became a parish in 1662, is proof of how ancient the first organisation of the settlement is. The existence of the church is first documented in 1414, but the building probably dates back to earlier than the 14th century. Over time, the territory has become more and more organised with Tisèr at the centre – a reference point with its church, parsonage, school, and also the numerous hamlets, villages and isolated houses scattered all along the valley. 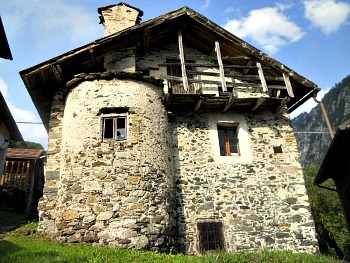 Nowadays, the building development on the mountainside that from the valley bottom at Titelle rises all the way to Forcella Franche mainly dates back to the 19th century: the oldest inscriptions and dates that are sometimes engraved on the ridgepoles date from the end of the 18th century (the oldest is 1776 at Ren) and then continue for the whole of the 19th century, until the beginning of the 20th century (above, the picture of an old house in Tisèr). The itinerary of this trail follows the original road drawn among the various settlements, generally going between Forcella Franche (about 1,000 m), Tisèr and the valley bottom, through the hamlets of Curti and Ren, all the way to Titelle and the road branching off to Pattine and California (described above). The trail doubles the main old artery of communication, from which innumerable other paths branch off, including the track connected to the mining sites of Valle Imperina and Vallalta. Until the last century, the prevailing economy was a part-time one: the mines, wood crafts (‘caregheta’ – as the local chair makers were once known) and some subsistence agriculture were all there was. Proof of this part-time economy is to be found in the fact that settlements were mainly composed of small groups: this scattering is typical, but was nevertheless characterised by an intense place-names giving activity, each site being well-defined (and having its name often taken from one of its inhabitants – i.e. the Curzis, the Bittis, the Giandis etc). The prevailing architecture is disciplined with a small floor area, the dwellings above and the farmhouse buildings annexed. Often, the direction of the roof top line is parallel to the level curves, so as to take advantage of the common walls between houses; these are alignment practices that are not so frequent in the Agordo region, but are rather typical in Tisèr, Curti and Ren. The use of materials is also reduced: stone prevails – especially the local grey schist, or a white calcareous, lighter type of rock –; the colour of the walls is often grey or neutral. White plaster is only present on the walls of the richer houses, or those which have been restructured more recently. Finally, the presence of ‘small’ signs on the territory continues: this is in fact the culture of micro-intervention; that is to say the constant, punctual, daily control of every portion of land. Continuous sequences of dry stone walls and terraces (such as at Ren, for instance), flooring, canals and ditches, supporting works and particular, specific solutions (like the porticoes at Curti, for example, or the agricultural lay-out at Lambroi – and much more to be discovered in situ) all tell us the stories of many men and women and their small communities, which propose a model of organization which was maybe prophetic then, and that still has a lot to teach us today.